Marshall states the law thus: The additional benefit which a person rives (rum a fen increase of his stock of a thing diminishes with every creative in stock that already has.We might add that with every diminution of his stock. the marginal utility will go on increasing. 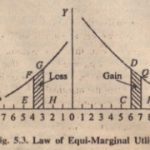 In other words, the marginal utility varies inversely with the stock, although not necessarily in the same proportion. As explained below, two important reasons can be given, for diminishing marginal utility: (a) Each particular want is satiable. and (b) goods are imperfect substitutes for one another and they tend to be consumed in appropriate proportions. The following diagram illustrates the Law of Diminishing Marginal Utility as applied to the consumption of toasts, See the table given. OX and are the two axes. 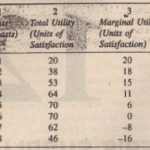 Units of toasts arc measure along OX and units of utility along . Utility of the first toast is represented by the rectangle standing 011 a portion of the axis of X . Similarly. 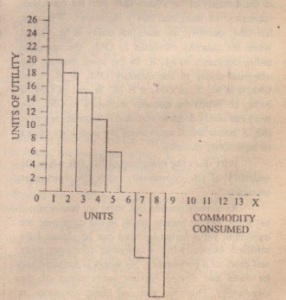 the utility of each successive unit consumed is represented by the rectangles as shown in the diagram. These rectangles become smaller and smaller, as consumption of units proceeds. The sixth toast has no utility. The seventh and the eighth have negative utilities, as shown by the rectangles below the axis of X. (b) Another reason of thc diminishing marginal utility is that goods are imperfect substitutes for one another. Different commodities satisfy different wants. When a consumer goes on consuming a commodity, the marginal utility falls as his want is satisfied. But if the commodity could be substituted for other commodities, it would. 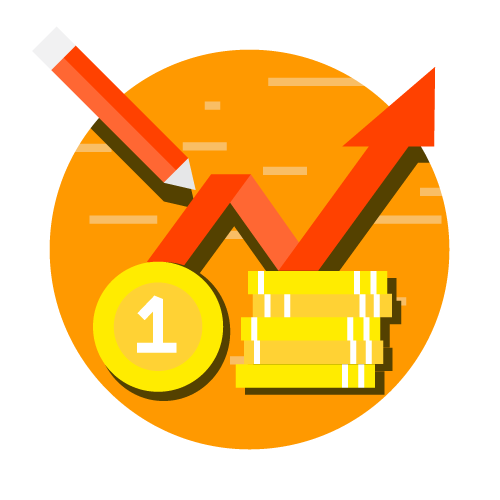 have satisfied other wants.Its marginal utility would not have decreased even though its quantity increases.